Hawaii's aloha shirt has become a visible manifestation of the state's multicultural population, and in Hawaii, wearing these shirts represents both an attitude and Hawaiian identity. The style lines and design motifs of the aloha shirt developed from the interaction of several of Hawaii's immigrant groups. The aloha shirt took its shape from the shirts worn by the first Caucasian men to appear in the islands-British and American sailors. In addition, the looseness of the shirts worn by Filipino men, the barong tagalong, was incorporated as a key element of the aloha shirt as an adaptation to Hawaii's tropical environment. The early aloha shirts (1920s-1930s) were made of Japanese kimono fabric by Chinese tailors, and the early customers were haole (Caucasian) residents and tourists, or hapa haole (part Caucasian) residents of Hawaii. It was not until World War II that the local population embraced the wearing of aloha shirts. 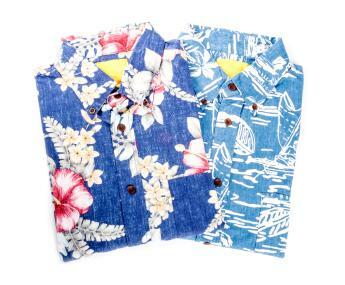 The early aloha shirts were made of silks and kabe crepe, with Asian design motifs. Ellery Chun trademarked the aloha shirt in 1935, and from that time on designs took on a tropical Hawaiian theme for quite some time. Rayon of good quality was not available until the early 1940s. When it was adopted for use, vibrant colors and designs were the result and these shirts were called "silkies" due to the feel of the fabric. Silkies are the most highly collectible of the aloha shirts, and were produced until the mid 1950s when they went out of style. The 1950s featured abstract designs and cotton fabrics, and in the 1960s the reverse-print aloha shirt was created to look like faded shirts worn by surfers. While tourists ignored these shirts, locals immediately adopted them as a badge of Hawaiianness. Synthetic fabrics with ethnic designs became popular in the 1970s aloha shirts. Tropical designs of flora and fauna have consistently been featured, and the 1990s favored retro styles in rayon and silk. Manufacturers have brought back some of the original designs of the famous "silkies" of the 1940s and 1950s. The aloha shirt has had an impact on American business attire. The production of reverse-print shirts worn for work by most men in Hawaii have kept pace with more vibrant shirts that are worn for more casual occasions. Hawaii's aloha shirt began America's movement toward business casual attire in 1962 when Hawaii's government required men to wear it throughout the summer, and then later on, Aloha Friday was declared, and workers were (and still are in the early 2000s) expected to dress in aloha attire every Friday. One could say that Aloha Fridays led to Casual Fridays on the U.S. mainland. Throughout the mid-twentieth century, tourists and soldiers brought the aloha shirt to the U.S. mainland but more importantly, the aloha shirt migrated to California on the backs of surfers who brought the relaxed shirt and lifestyle to the mainland. This was the beginning of the business casual movement, as many of the young California surfers grew up to become Silicon Valley executives who shed three-piece suits for more relaxed attire at work and instituted Casual Fridays into the world of business. See also Colonialism and Imperialism; Cotton; Rayon. Arthur, Linda. Aloha Attire: Hawaiian Dress in the Twentieth Century. Atglen, Pa.: Schiffer Publications, 2000. Brown, David, and Linda Arthur. The Art of the Aloha Shirt. Honolulu, Hawaii: Island Heritage, 2002. Hope, Dale, and Gregory Tozian. The Aloha Shirt. Hillsboro, Ore.: Beyond Words Publishing, 2000.